Actually, I didn’t really have one, this was more of a field study, but if I were to give a “throwing darts in the dark” hypothesis, it would be: Not being on Facebook will generally improve your personal relationships with people, but a few vital elements of daily life will be missing. Monday was my first “cold turkey” day. Overall productivity was not that much improved; I awoke late and spent a lot of time on the Internet, just not on Facebook. A lot of it was spent on music and model railroading informational forums. So in effect, I was looking for a surrogate for my little Facebook dependency. Spent some time cleaning my room, folding away clothes, practicing bass guitar. Doodled on a song sequence on Propellerhead Reason for a bit. Watched the Dodger game on TV. Did not really go out except to do errands, some errands were delayed for another day. Much of my phone contacts was centered around finding an available drummer and arranging rehearsals for my band’s upcoming Lotus Festival show in Echo Park on July 10. I did notice that everyone I called save for one person had me leave a voice mail message. 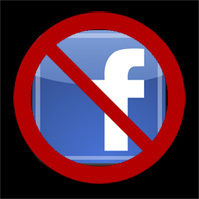 At times I felt a little isolated from the outside world, but didn’t feel any craving to log into Facebook. Did not use Twitter today.